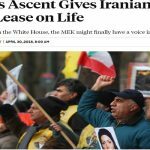 Foreign Policy article demonizes MEK – The continuation of the failed policy of appeasement. On May 11th, the National Council of Resistance of Iran (NCRI) published an official rebuttal to the most recent smear attack against the MEK by the ruling regime. 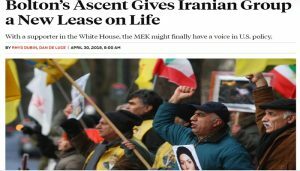 The article, entitled “Bolton’s ascent gives Iranian group a new lease on life” was published on ForeignPolicy.com on April 30th and claimed that the MEK does not enjoy popular support within Iran and is thus not a viable alternative to the current regime. The mullahs have often used these false claims in their failed attempts to delegitimize the MEK, and it is unsurprising that they should do so again, in the wake of the uprising in Iran that began last December. The recent uprising, which took place in 140 cities across Iran in late December and January, clearly indicated a desire for regime change amongst the Iranian people, who chanted “Down with Rouhani!” and “Down with Khamenei!” This threatened both the mullahs’ regime and the regime’s lobbyists and apologists in the West, who had clearly misunderstood the will of the people in their assessments. The policy of appeasement to the regime has been popular in the West for decades, a policy which assumed that the people were happy with the oppressive regime and that the best way to deal with Iran was to appease and compromise with its ruling mullahs. Part of the appeasement policy focused on going along with the regime’s demonization campaign against the opposition, specifically the MEK, which relied on lies about the organization. This appeasement policy no longer works in the face of the popular uprising in Iran. The strength of the movement has become undeniable. The Foreign Policy article is an act of desperation by those who advocated appeasement, as they struggle to justify their failed policy. The power and popularity of the MEK has grown to the point that Khamenei himself acknowledged it, saying that the MEK organized the recent widespread uprising. MEK members inside Iran come from all walks of life and include “academics, intellectuals, scientists, traders, and businessmen.” MEK members outside of Iran include some of the country’s most educated and productive citizens, who left Iran to escape its repressive regime. The most recent MEK gathering outside of Iran was held in Paris on July 1, 2017, and more than 110,000 people attended. The MEK is the largest non-governmental organization in Iran and has formed hundreds of associated groups. The “experts” quoted in the article are known regime apologists who have touted hollow “reforms” and moderation by the regime. But the Iranian people have seen that these claims ring false and are demanding change. Recently, the President-elect of the NCRI, Mrs. Maryam Rajavi, revealed her 10-point plan for regime change, which was met with bipartisan support from numerous American officials and dignitaries. Military leaders from four past administrations, U.S. Congressmen, and officials dealing with national security have taken part in NCRI meetings. This diverse group of Democratic and Republican leaders has embraced the MEK’s opposition movement as the logical alternative to the dangerous and oppressive Iranian regime. The article also included patently false statements about the MEK’s inclusion in and subsequent delisting from the list of Foreign Terrorist Organizations. These claims have been rejected by courts in the U.S., U.K., E.U., and France, who all delisted the resistance organization after no evidence was found that the MEK participated in any terrorist activities. In fact, the inclusion of the MEK on the terrorist lists was a goodwill gesture to the regime and was used as a bargaining chip to curry favor with the mullahs. All of this information is recorded in numerous court rulings across the West, and many Western leaders later denounced the MEK’s designation on the list. Further claims that the MEK fought against the Iranian people in the Iran/Iraq war are also false and easily disproven. The MEK was an Independent presence in Iraq throughout its time in the region. According to the rebuttal, “eight American agencies confirmed this via a 16-month investigation and even the current, Tehran-controlled government of Iraq has not been able to provide any evidence to the contrary. The claim that the MEK helped expose the nuclear weapons program in Iran is not in dispute. The MEK was a leading force in exposing the regime’s dangerous nuclear program, using its expansive network of members inside Iran. These members exposed the nuclear program at grave personal risk in order to prevent nuclear war. The world at large has benefited from their brave actions. The regime and its apologists can no longer deny the power of the resistance movement led by the MEK, so they are once again attempting to demonize the organization. These desperate acts are the last gasps of a dying theocracy vainly attempting to hold onto power. The people have demanded regime change and will not be fooled by lies and deceptions.